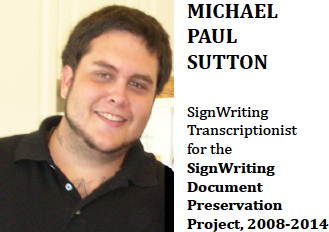 Michael Sutton, and his brother Andrew Sutton, both worked as SignWriting Transcriptionists on the project. They were handed old documents written by hand, or written by older software, and then they copied, or transcribed each document one sign at a time, symbol by symbol, into SignPuddle Online. Because of this preservation work, we can now produce printed versions of these old dictionaries and documents, and web visitors can read them online.